Bring a Western Twist to Indian Wedding Decoration with these Welcome Sign Boards! Remember those thermocol wedding sign boards with the bride and grooms names and initials? The ones jazzed up with purple and blue glitter along with cheesy arrow-pierced hearts? Well, all we can say is we’re glad Indian wedding decoration has come a long way from that! From Hotel menu lettering to hand drawn signs, we’ve seen it all! But new age weddings bring with it their own style of contemporarizing each element of the wedding – even wedding welcome banners! What might be considered irrelevant in the wedding decoration process can in fact be the initial impact maker of your entire wedding setting. The wedding welcome banner and signs are the first thing your guests will set their eyes on – make this first impression the best one! Here, we list down some ideas from the west and some from our own desi weddings that bring on a new, fresh take to wedding signages, boards and banners for your Indian wedding decoration! Since thermocol is completely out of the question! Use elements like wooden plans, transparent glass frames and even chalkboard styled banners to bring on a new feel to your Indian wedding decoration! Sweet words written on wooden planks - lovelove. Make it known to all mankind with this wooden styled confession of your best day ever! Lead people the right way with this cute sign board idea - just like Mira and Shahid had! Or a fairytale beginning like this one! Flowers, flowers, flowers - You can never go wrong with flowers! A new wedding trend that helps people keep full focus on the wedding ceremony - Unplugged Weddings! Adorable rhymes like these are sure bring your guests some smiles! Verses from the Bible that sum up your marriage and love life also make for a beautiful idea! Get on board with the adventure! No "Grooms Side" & "Brides Side" here! Cute wording ideas for wedding sign boards! Write your love story in a few simple words! Jazz it up with some color! Use a transluscent background to make the metallic fonts pop! Turn your favorite song lyrics into a signage! 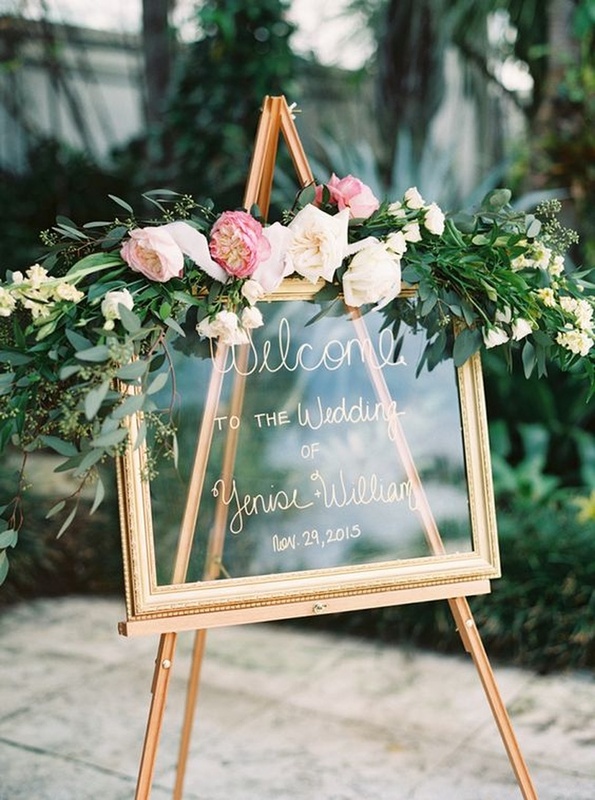 All the information a wedding guest would need put beautifully on a wooden board!